Can’t make it in for dining? No worries, we will deliver to your home or office! Place your order TODAY! 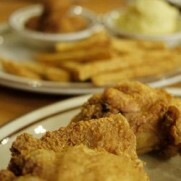 See our great menu for various traditional Soul Food dishes made just like home! Not only can you get Chicken & Waffles, but here at Soul Food Cafe, you can have your choice of many traditional breakfast dishes! 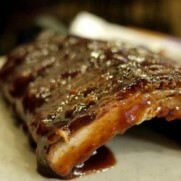 Enjoy your next great meal at Soul Food Cafe! 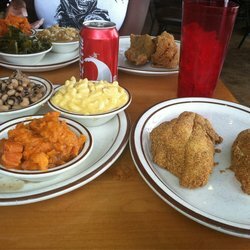 Soul Food Cafe Voted Best Soul Food 2014. We specialize in Fried Catfish, Fried Chicken, Oxtails, Biscuits and Gravy, and so many more. Breakfast and Chicken& Waffles served All day long. 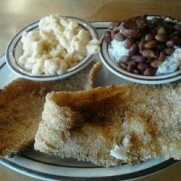 The only soul food restaurant that offers Grilled items such as Red Snapper, Catfish, Pork Chops or Chicken. Known for the Best Sugar Daddy's and Sugar Momma's in town. Soul Food Cafe is the only soul food restaurant in town that delivers right to you. Allow us to cater your wedding, party, or business meetings.. All venue's are customized to suit the individuals or companies. Thank You Las Vegas for all the votes and reviews. We are the Winners of 2014 Best of Soul Food for Best of Las Vegas Thanks Again! We love pleasing our customers with our great secret seasonings and famous hot cornbreads. Our homemade gravy is also another talked item to try out. We have created a speciality drink that has been the #1 selling item called Sugar Daddy or Sugar Momma! We are dedicated to work hard and appreciate each and everyone's chance of satisfying your hunger. We are happy when you decide to share beautiful pictures of our food with your friends and family!